The financial value of EU reported CITES-listed animal imports in 2014, excluding caviar extract, is estimated to be approximately USD717 million (~ EUR 641 million). Noting potential differences arising from the altered methodology, the value of imports appears to have increased when compared to 2013 estimates (USD644 million). As in previous years, the value was dominated by reptile commodities, with trade in reptiles accounting for 83% of the value, reflecting the relatively high volume of EU imports of this group. Trade in wild and ranched CITES-listed animals imported into the EU in 2014 accounted for 72% of total import value (USD519 million or ~EUR462 million), an increase from the 2013 estimate of USD461 million. The value of captive-produced imports decreased slightly in 2014 to approximately USD186 million (~EUR167 million, or 26% of value) compared to USD177 million in 2013. Proportion of EU animal import value (2014 USD) by source in 2014. 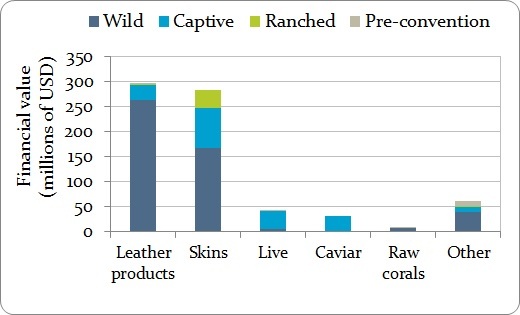 Leather products and skins were the top two commodities imported by value when excluding caviar extract, representing 41% and 40% of the overall estimated value, respectively. This mirrors findings from previous years (2010-2013). The value of the key commodities imported by the EU in 2014 is summarised in the Figure below. Value (2014 USD) of trade in the top five commodities imported by the EU in 2014 (excluding caviar extract), with an indication of the combined value of the remaining terms (“other”). All Euro equivalent values throughout this section are based on an exchange rate of 0.89 EUR to 1 USD from http://www.xe.com/ on 03 August 2016. When comparisons to 2013 prices are used, these reflect values published in the 2013 EU Analysis of Annual Reports that are based on slightly altered methodology. 2013 prices were based on medians of USD equivalent value from 2008-2012, as opposed to the 2014 USD value derived from the median over 9 years (2006-2014) of United States price data. In addition, in the 2014 Analysis price data for species and genus level have been used where available; prior Analyses used only prices at Family and Order level. Annual figures from previous years have been corrected for inflation. Leather products (encompassing both small and large leather products) accounted for 41% of animal import value in 2014, although they accounted for only 18% of import volume. Leather product imports were valued at approximately USD296 million (~EUR265 million), an 8% decrease in value based on the 2013 figure of USD323 million (corrected for inflation). Over 99% of the value of imports were from reptile leather products, with Alligator mississippiensis (American alligator) accounting for 53% of total leather product import value alone. The second highest value import commodity was skins (USD284 million (~EUR254 million), which were also the top commodity imported by volume (>1.5 million skins). This represents an increase in the value of skin imports in 2014 compared to 2013, when the value was an estimated USD216 million, correcting for inflation. 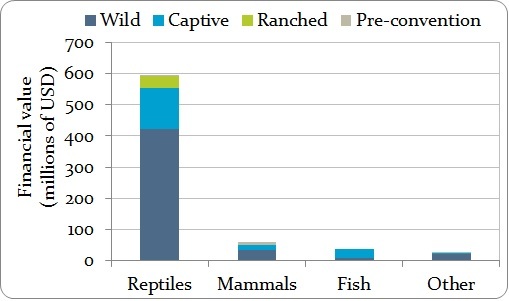 As with leather products, skin imports were dominated by reptile skins and over 85% of the reptile skin trade by value was dominated by the same four species as in 2013, in order of importance: Alligator mississippiensis (American alligator), Crocodylus niloticus (Nile crocodile), Python reticulatus (Reticulated python), and P. bivittatus (Burmese python). 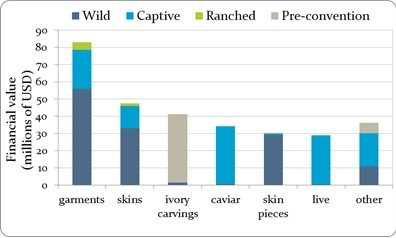 As in previous years, the price of skins in trade was affected by the source of the specimens; the median value for wild-sourced Alligatoridae skins (USD285) was higher than ranched skins (USD209) and almost three times the value of captive-produced skins (USD73). Live animals represented the third highest value trade flow in 2014, just under USD42million (~EUR37 million), representing a large increase compared with 2013 estimated values of USD28 million. Whilst corals (Anthozoa), reptiles and leeches (Hirudinoidea) accounted for 96% of imports by volume, live mammals accounted for the highest proportion of the trade by value (48% or USD20 million, ~EUR18 million). 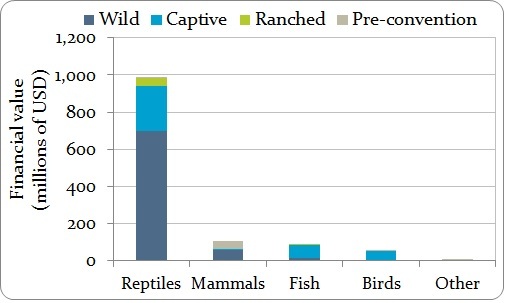 The majority of this value was in captive-bred Macaca fascicularis (Crab-eating macaque), imported mainly for biomedical purposes (88% of total value of live mammals). Live reptiles accounted for 35% of import value, over 60% of which was in imports of two species Mauremys reevesii (Chinese pond turtle) and M. sinensis (Chinese stripe-necked turtle). Summary of quantities and estimated values of the highest value captive and wild-sourced live animals imported as no. individuals by the EU in 2014. As in previous years, caviar extract was the highest value import commodity in 2014, amounting to USD2.58 billion (~EUR2.31 billion), due to extremely high value estimated for this product by the United States Customs data (one kilogram of caviar extract is worth USD9.3 million (~EUR8.4 million) or USD9 300 per gram). Used in cosmetics, luxury moisturising creams and skincare preparations due to its purported anti-aging properties, this commodity is imported in very small quantities. However, it is unclear whether the declared prices in the United States dataset represent the actual price for the extract in its natural form or the luxury commodity containing the extract, both of which are traded. In total, 181 kg of extract were imported by the EU in 2014, mainly comprising Acipenser baerii (Siberian sturgeon). Virtually all extract (>99%) originated from captive-bred or captive-born sources; Switzerland was the main EU trading partner accounting for 89% of the value of EU imports. When caviar extract is included, the total value of CITES-listed animals and animal products imported by the EU in 2014 was estimated at USD3.3 billion (USD 3 295 192 596 or ~EUR2.95 billion), which is over a billion dollars less than the estimated value for 2013 (USD4.89 billion, corrected for inflation). “Billion” in this report is used to refer to 109. The main trading partners are shown in the Figure below. Estimated value (2014 USD) and source of EU animal imports (excluding caviar extract) from the top five trading partners in 2014. Countries marked with a* are megadiversity countries. This section analyses the value of both direct and indirect exports; hereafter, ‘exports’ refers to both direct exports and re-exports, unless otherwise specified. The financial value of EU-reported CITES-listed animal exports in 2014, excluding caviar extract, is estimated to be approximately USD1.1 billion (1 079 585 582~ EUR1.11 billion), almost double the estimated value of imports to the EU in 2014. Export value in 2014 was lower that the estimated value of exports in 2013 (USD1.53 billion, corrected for inflation). Caviar extracts have been excluded from the rest of the overall analysis and will be presented separately, due to their disproportionately high financial values (almost USD23 billion [~ EUR20 billion] combined). All figures given in the rest of this section are exclusive of caviar extract, unless otherwise stated. The relative export values of different taxonomic groups are shown in the Figure below. Reptiles were the highest value group, reflecting high volumes of reptile exports in 2014. Mammal exports, although ranked third in terms of financial value in 2013, were second in 2014, and the total export value of birds fell from 6% of total export value in 2013 to 3% in 2014. Overall, EU exports of wild-sourced and ranched CITES-listed animals in 2014 accounted for USD725 million (or ~EUR651 million; 67% of total estimated value), whilst captive-produced exports were worth approximately USD308 million (~EUR276 million, or 28%). The proportion of CITES animal exports from different sources varied between taxonomic groups. Value of EU (re-)exports of the top animal products (excluding caviar extract) by class and source in 2014, with an indication of the combined value of the remaining terms (“other”). The highest value animal commodity exported from the EU in 2014 was leather products (combining the value of both small and large leather products), which were worth ~USD779 million (EUR699 million), 71% of which was wild-sourced. 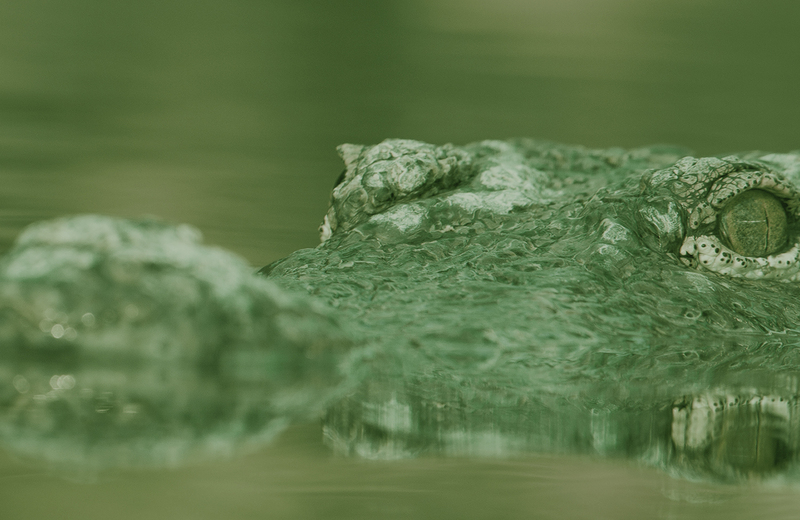 The highest value species exported as leather products were Alligator mississippiensis (American alligator; 64%) and Crocodylus niloticus (Nile crocodile; 12%). By value, the main exporters were France (41%) and Italy (33%), and the top importers were Switzerland (56%) and China (12%), although the EU itself is the main consumer of the leather it produces, absorbing two-thirds of leather sales. The total annual export value of CITES-listed leather products manufactured in the EU is therefore likely to be substantially higher. The value of leather products accounted for 72% of the total animal export value in 2014. The commodities that comprise the remaining 28% are summarised in the Figure below, along with their sources. Value (2014 USD) of trade in animal commodities (re-)exported by the EU in 2014 (excluding leather products and caviar extract), with an indication of the combined value of the remaining terms (“other”). Combined, garments, skins and skin pieces accounted for 8% of animal export value in 2014, and similar taxa were of highest value in exports of all three terms. For exports in all three groups, wild-sourced products made up the majority of trade value (64% in total across the three groups). The top species exported as garments, skins and skin pieces are shown in the Table below. In 2014 exports of ivory carvings were valued at over USD41 million (~EUR37 million). Ivory carving exports were predominantly from Loxodonta africana (African elephant; 73% USD30 million or ~EUR27 million), and 97% were pre-convention. Caviar exports were worth around USD34 million (~EUR31 million), a slight increase from 2013 (USD33 million), with over 98% being from captive sources. Live animal exports from the EU were estimated to be worth almost USD29 million (~EUR26 million) in 2014, considerably lower than the 2013 figure of USD69 million, possibly due to a decrease in the volume of live birds exported, from 133 000 in 2013 to 83 000 in 2014. Despite this, as in 2013, export value was dominated by birds (83%: USD24 million or ~EUR22 million), followed by reptiles (7%: USD2 million ~EUR2 million). The Table below summarises the main species in trade in each group. * No species level price available so a proxy of the genus level price was used. Cotance, 2012. Social and Environmental Report – the European leather industry. As for EU imports, caviar extract was also the main commodity exported from the EU by value in 2014, amounting to USD22.6 billion (~EUR20.2 billion), virtually all of it captive-bred. The value of this commodity declined based on 2012 and 2013 estimated values, to reflect decreased volumes in trade. Seventy-seven percent of the value of the exported caviar extract was derived from Acipenser baerii (Siberian sturgeon). When caviar extract is included the total value of CITES-listed animals and animal products exported by the EU in 2014 was estimated at USD23.6 billion (USD23 633 068 131or ~EUR21.2 billion). ”Billion” in this report is used to refer to 109.